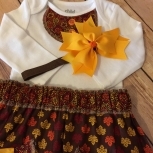 This precious yellow and gray outfit with cute little duckies would be beautiful for that first Easter. Comes complete with gown, two burp cloths, bib and hairbow headband. It's bright cheerful and just shouts out Spring! One of a kind and unique, definitely to be a standout this season. 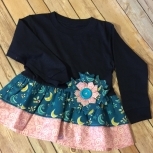 The elastic waistband skirt is attached to a Child of Mine by Carter Onsie,. so no more riding up or constantly adjusting the baby's outfit. 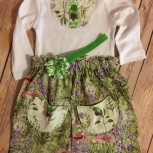 Skirt has been serged for a professional and finished look. 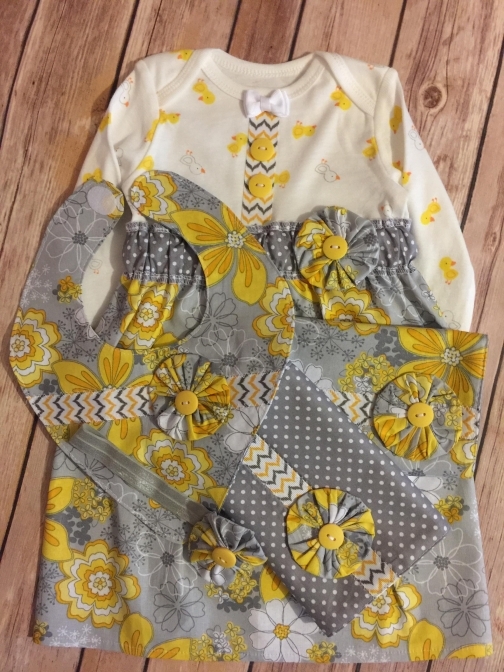 Burp cloths and bib are double layered and embellished with yo-yo flowers with bright yellow button centers with the gray and floral material and contrasting gray with white polka dots. They have also been top stitched for a neat appearance and add durability. Soft satin elastic headband also adorned with a matching yo-yo flower. Item was made in a smoke and pet free environment.